So far, we have got an understanding of Cucumber and what it does. It executes the test scripts, which have been defined in the feature file (to be covered in subsequent chapters). 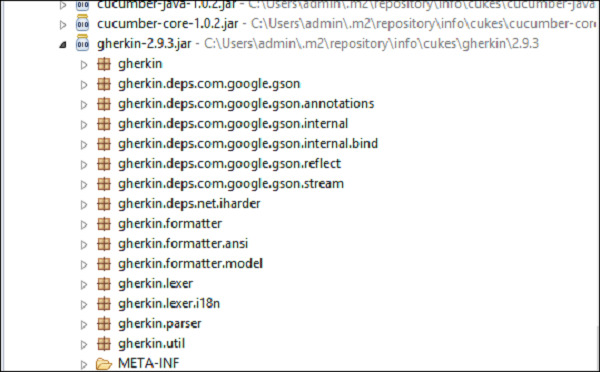 The language, in which this executable feature files is written, is known as Gherkin. Gherkin is a plain English text language, which helps the tool - Cucumber to interpret and execute the test scripts. One may think that, it has been discussed many times that Cucumber supports simple English text then why we need a separate language - Gherkins. The answer lies in the concept of the Behavior Driven Development. As discussed earlier, we had seen that BDD incorporates different prospectives while creating test scripts. It can be development prospective, business prospective, etc. That said, we will need people from different community like developers, project managers, product owners, and testers while developing test scripts. As these people do not belong to the same category, there is a risk of not using the common language for test script conceptualizing. This was the evolution point for Gherkins. Gherkin provides the common set of keywords in English text, which can be used by people amongst the different community and yet get the same output in the form of test scripts. Feature − Login functionality for a social networking site. Given I am a social networking site user. When I enter username as username1. And I enter password as password1. Then I should be redirected to the home page of the site. The above-mentioned scenario is of a feature called user login. All the words highlighted in bold are Gherkin keywords. Gherkin will parse each step written in step definition file (to be covered later). So the steps mentioned in the feature file and the step definition file (to be covered later) should match. Another interesting fact about Gherkin is, it supports not only English but many other native languages such as French, Finnish, Indonesian, Hungarian, Hindi, Urdu, Gujarati, etc.